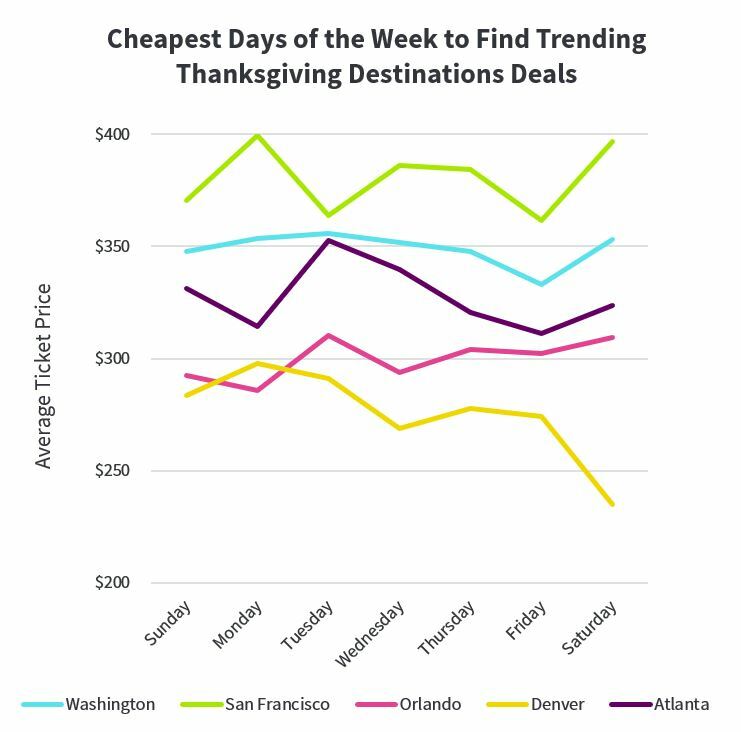 At Skyscanner, we crunched the data from years past to reveal the best time to book Thanksgiving flights for the 2018 holiday. If you haven't booked yet, get your credit card ready, because we're currently in crunch time for Thanksgiving flights! Based on 2017 booking data from 60+ million monthly users, here is some useful information on the best time to buy flights for Thanksgiving 2018. Takeaway: Now is the time to book! The above deals were found through a U.S. to Everywhere search in the month of November 2018. Prices change frequently – set a price alert to know when they do! 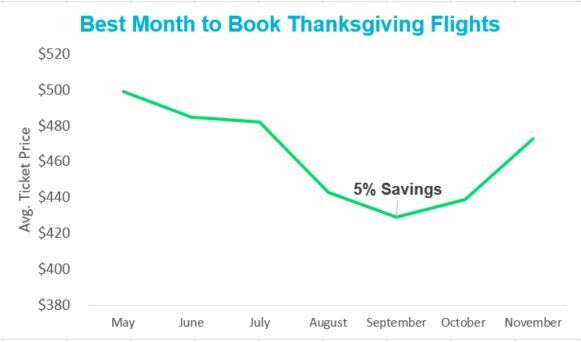 According to analysis of 2017 Skyscanner booking data, the cheapest month to book Thanksgiving flights is September when the average price for flights will be $429 (tap here to search now). There will still be savings to make in October when the average Thanksgiving flights price will be $439. 13 weeks before Thanksgiving 2018 is expected to be the cheapest week to book your flights. Travel deals could be 7% cheaper than the average price of flights. 8 weeks before Thanksgiving is another time for bargains with flights 6% cheaper. We took a look the range of prices people paid for Thanksgiving flights in 2017 to give some insight on what flight prices may be around the end-of-year holidays. The average price was $528. The majority of travelers who booked with Skyscanner found flights for cheaper than average, with the largest group booking flights in the $300-400 range. The average search lead-time is 53 days out on September 30. 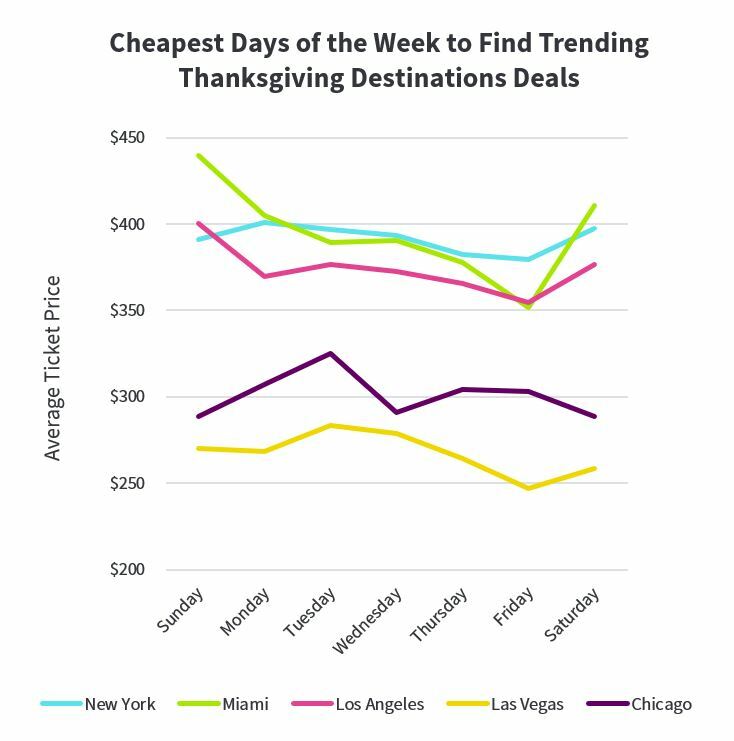 Analysis shows that early booking helps to ensure you find the best flight deal before you fly home for the holidays. Find which departure days to avoid for your Thanksgiving flight based on 2017 flight bookings. Bear in mind, last year’s Thanksgiving was on Thursday, November 23rd. Overwhelming, the Wednesday right before Thanksgiving (Nov. 22nd) was one of the busiest days across most destinations to fly for the holiday. Beware of last minute flights and plan accordingly for long security lines! Each Friday prior to Thanksgiving was naturally busy as well (Friday the 10th and 17th of November). The Sunday before Thanksgiving (Nov. 19th) proved to be one of the least busy dates to travel across destinations. Tuesday the 14th of November and Sunday the 12th of November were low traffic days, as well, if you plan on taking an extended Thanksgiving vacation! If one of these destination cities happens to actually be your return city, Saturday November 25th was a low traffic day after Thanksgiving. It also pays to book early for your international flights if you choose to spend Thanksgiving with friends or family outside of the United States. 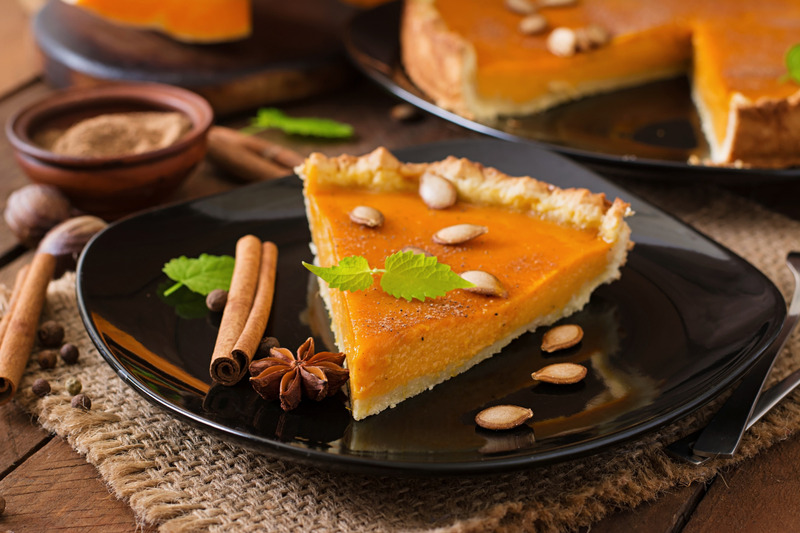 Book your Thanksgiving Flights today! Looking for the best last minute flight deals to anywhere in the world? Check out our daily flight deals page and grab the cheapest flights with the highest savings today. Book free now! 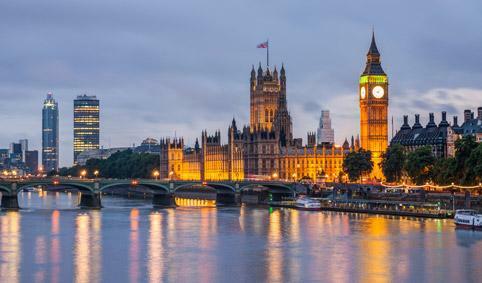 Looking for cheap flights or would like to enjoy a last-minute holiday? Every week we round-up the best travel deals and the cheapest flights to a variety of destinations – all under $100! So, whether it’s a sunny beach or a budget weekend getaway you’re looking for, check out the best prices right here before you book. Our useful flight price tracker will keep an eye on your chosen flight and let you know as soon as the price drops – or if it starts to rise. Last minute flights used to be the go-to for travelers looking for cheap flights. But in the age of budget airlines, are last minute flight deals impossible to find today?